Click on a date for more information about an event in Aiken County. Some events have maps that help you find your way. Come enjoy fresh, local goodness with vendors selling produce, baked goods, honey, artisan goods, beef, eggs, and pork! Williamsburg Street between Park and Richland Avenues was the site of the Aiken Cotton Platform and Scale. It was a raised wooden structure open to the elements. Bales of cotton were stored for two blocks along the street up to the cotton gin, across from the Coward-Corley Seed Co. Farmers parked their wagons and cars under the trees. At the busy market, open Monday – Friday, they sold cotton, produce and homemade goods. On Saturdays, beginning in the late 1920’s, farmers, also, sold produce from a shed behind the Public Works building on Newberry Street. Farmers’ wives, who were part of the Aiken County Council of Farm Women, organized the Club Market, Sept. 4, 1930. The ladies sold flowers and bulbs to finance beautification projects in Aiken. Often they had homemade baked goods that were sold for “pin money”. The goods for sale were propped on bales of cotton at the Williamsburg location or on wooden tables at the Newberry location. By 1951 both venues were struggling to stay open. The family farmer was unable to compete with large commercial cotton growers. So the markets decided to combine forces. The Farmers’ Grange with county chain gang labor erected the current structure located in the parkway. By 1954 the farmers and their families built the 45 tables, which are still used today selling homegrown produce, flowers and homemade goods. In 1980, plans were made to sell the property for commercial development. Thanks to the efforts of Rosamond McDuffie and the Aiken Historic Preservation Commission, the Market was rescued. 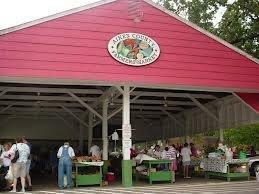 In 2003 the Aiken County Farmers Market was designated a Landmark in Aiken. It is the oldest (in continuous operation at the same location) county farmers’ market in the State of South Carolina. Water from countless flower buckets has been poured on the trees in the last fifty plus years. The oaks have grown and now shade the building. Today, descendants of the early farmers bring produce and flowers to the Market. They set their goods on tables that were used by their parents and grandparents, continuing the traditions of small family farmers. The Market, now as then, is a place where items are offered for sale and conversation and recipes are shared with friends, old and new. Different events and activities occur on Saturdays throughout the year, so come by and enjoy the experience! We look forward to seeing you at the market soon! Aiken County Visitors Center staff can assist you in planning your trip to beautiful, historic Aiken County, South Carolina. We have a great selection of souvenirs, postcards and t-shirts for you to take back home for yourself, friends and family.